It’s rigged with the lure tied above the weight allowing you to shake, quiver or dead-stick your lure while keeping it in the strike zone. It can be extremely effective at times and can be used pretty much all year round (depending upon where you live). There are several different ways that you can setup a Drop Shot rig. These days’ manufacturers are making it really easy for us to choose the right tackle for the job by naming their products after specific bass fishing techniques. The most common setup you will find uses a “drop shot hook” and a “drop shot weight” secured to your fishing line. Sounds pretty simple, right? So let’s go over some of the components used for making a Drop Shot rig in a little more detail. I will also give some examples of different Drop Shot setups that can be used for both categories I mentioned above (Finesse & Power Drop Shot). I highly recommend reading our “Captain Hook Article” for some great advice on hook selection. This is the one place you can really get creative. The sky is the limit here. As always conditions should dictate what lure size, shape and color you choose. If you don’t want to be bothered with all the little details and would like some general recommendations, here are a few of my personal favorites by category. Match this up with your favorite drop shot rod and reel spinning combo and you’re ready to go Finesse Drop Shotting. Match this up with your favorite worm/jig rod and reel combo(spinning or bait-casting) and you’re ready to go Power Drop Shotting. Q) How much line should there be between the hook and the weight when I tie a typical Drop Shot Rig? A) It truly depends on the circumstance (I hate that answer, but it’s the truth). What I can offer are some good starting points and some things to consider. In general 18″ -20″ from the hook to the weight will get the job done in most cases. If you talk to guys that drop shot a lot, you might find that they like to leave extra line trailing from the weight so they can increase the length if needed (shortening the length is easy). I personally have used as little as 8 inches from the weight to the hook and as much as 5 feet. There was always a good reason why one was preferred over another. If you are fishing with a buddy, you can both start with different lengths and see who gets more strikes. One person sets up at 12″ with extra line trailing from the weight (just in case) and the other sets up at 24″. One will usually outperform the other. Then make the adjustment so that both people are using the same length Drop Shot Rig. It is rare that you will need to be exactly to the inch with your setup. Fishing a finesse drop shot rig is very simple and in fact one of the best ways to work it is like a traditional Carolina Rig (Drag & Stop). I’d say that most of the time you’ll be dead-sticking. If you’ve never heard the term “dead-sticking” basically you are letting the lure sit still on a semi-slack line without trying to impart any action to the lure. So you cast it out, let it sink all the way to the bottom, reel up the slack until you have a slight bow in your line and pause(dead-stick) for about 10 seconds (count, it helps). Then drag the Drop Shot a foot or so and dead-stick it again. Repeat the process and feel for strikes. When you go to drag the Drop Shot, pay attention to how your line feels as you begin to take up any slack. If you feel any pressure “Set the Hook”! The nice part about setting the hook with a Finesse Drop Shot is that you don’t really “set the hook”… you “lean into the fish” with your rod. All you want to do is lift or sweep the rod and turn the reel handle. The hook does all the work. You just want to get a good bend in your rod by removing all the slack and applying pressure. You want to use a lighter drag setting when using the finesse drop shot rig because the hooks are very small and you don’t want them to tear out. 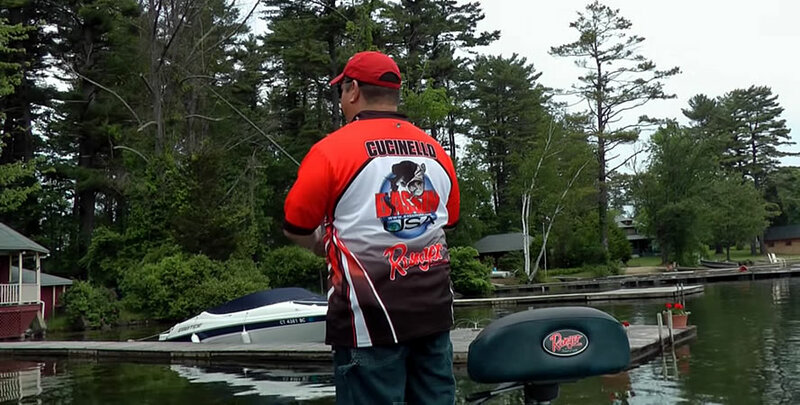 If you are going to power drop shot fish, your approach is a little different. You’re using heavy gear, line, hooks and lures. You need to set the hook when power drop shot fishing the same as you would with a worm or jig (especially if you Texas Rig the lure). Remember that this technique is tailored for fishing around and in thicker cover like weeds, brush, docks, etc. If you are fishing isolated cover in water shallow enough to see your target (the cover), cast into and around the target and let the lure dead-stick for a few seconds (let’s say 5 seconds). You want to leave a little slack in your line. 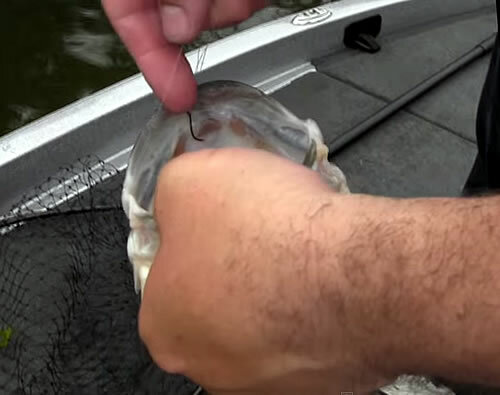 Then gently “Yo-Yo” the lure without lifting the weight off the bottom. So basically you want to softly lift the lure until you are about to feel the weight and then stop and let the lure fall again. You might repeat this process three or four times and then reel it in and make another presentation. Shaking your rod tip with a slight bend in your line will make your lure quiver and dance under the water. There are times when bass actually want the lure to move a little (especially during the spawn). Like all things, experiment to see what triggers a strike. Usually a shake, pause combination will do the trick. Having some slack in your line is a good thing with this technique. Granted, you will not always feel a strike and most of the time your line will just get heavy. Pay Attention! Just like when you fish a weightless soft plastic, bass will often pick up the lure and swim away with it in their mouth. If they feel resistance they typically spit out the lure. Find the “happy median” and you’ll increase your hook up ratio drastically. Water clarity and amount of fishing pressure will determine how light your line should be. Ultra-Clear lakes that receive a good amount of fishing pressure may require you to use as light as 4 lb test Fluorocarbon line. On another lake with water that is more stained, you might be able to use 6 lb test mono and have not trouble catching bass. A good starting point for finesse drop shot fishing would be 6 lb fluorocarbon. Unless you’re fishing under extreme conditions, you’ll be fine. Different shaped weights are designed for different things, but for the most part the shape is not a critical part of the system. You can take a “nut” from the old tin can in your garage and tie it to the end of your line and still catch bass. If you know that you are going to be fishing a lake with tons of rocks/boulders and weeds but you might try using a cylinder type weight instead of a round weight. Or if you want to keep the drop shot rig in one place for a long time (during the spawn for example), you might choose a round ball drop shot weight that will sink straight to the bottom and stick a little. If you’re fishing suspended bass in open water, the weight shape doesn’t really matter too much. 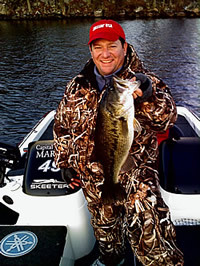 The general bass fishing rule is “match the forage that bass are feeding on” for the particular lake you are fishing. This rule applies to drop shot fishing also. There are thousands upon thousands of soft plastics out there. Pick a few that match the forage in your area and start with those… you can always buy more later. PART 3 – What’s Your Lure Doin’? Do you know what’s going on at the end of your line? I mean, do you really know what your lure is doing? Do you know what it just hit? Was it a rock? A log? A fish? Do you even feel your lure? It must seem like these questions are silly, but most anglers can’t answer them correctly. After the third or fourth cast some anglers slip into the repetitive mode or worse yet they don’t know how the lure is supposed to feel.